Despite their name, French fries are an entirely American delight. And there's nothing that feels more Texan than a big hearty burger with a side of fries. In fact, Texas takes their fries very seriously. From varieties soaked in buttermilk to others topped with cheese and bacon, there's something for every fry lover in this state. Here are our favorite places to get fries in Texas! Celebrity chef John Tesar of “Top Chef” fame calls Knife in Dallas, Texas home. Named as one of the Dallas Observer’s top 10 places for fries in Texas, Knife serves a fantastic steak fry and crispy avocado fries. Bosscat Kitchen and Libations in Houston, Texas serves a highly indulgent basket of fries smothered in pork belly, cheese, andouille sausage gravy, and okra. 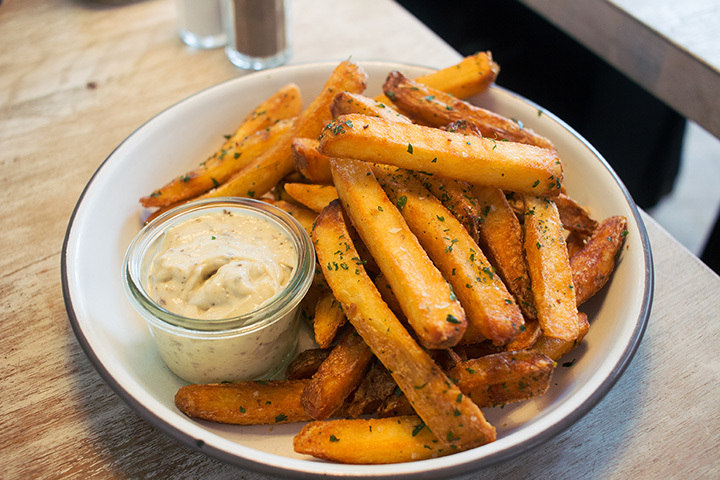 As long as you love fries more than your figure, you’ll absolutely adore these. Rodeo Goat is one of Texas’s best burger and fry bars, with locations across the Lone Star State. Stop by their restaurants in Fort Worth, Dallas, Houston, Plano, or Rockwell to try the cheese fries loaded with cheddar and chili. Get Fried is a new café franchise just starting to spread. They currently have locations in Florida, New York, California, Dallas, and San Antonio, Texas. The concept of Get Fried is simple: choose your fry base from hand cut, straight cut, seasoned waffle, and sweet potato, choose your toppings, and go. It’s like a Chipotle for fries. ROKO Grill in Katy, Texas serves a mouth-watering, artery clogging dish aptly titled the “Heart Attack.” From the menu description, the Heart Attack is a bed of waffle fries topped with your choice of beef, chicken, pork, or sausage, with bacon, BBQ sauce, cilantro sauce and chives. La Frite in San Antonio, Texas offers “casual fine dining” with a Belgian twist on southern food. Their twice-fried, hand cut fries were named as the #45 best fry in the United States by the Daily Meal. Fork in the Road is an Arlington original serving some of the best diner food in the state. The fries are crispy without dripping grease and come as the perfect side to all of their burgers and sandwiches. The Spot in Galveston serves burgers, seafood, and some of the best fries in town. The waffle fries are simply delectable. You’ll find yourself ordering a second helping. Border Burger Bar has two Colorado locations, but the premier location is the original one in El Paso, Texas. They’ve got a few different kinds of fries to choose from, but we recommend the kimchi fries, served with cheese sauce, Bulgogi, Kimchi, diced tomato and serrano slices.